From the diary of a fashion designer : Colour White , the purity of Soul ! Let's think about Fashion ! Can you see colour ? You do I am sure :)) because Indian Fashion means a lot of colour ! But today we are going to talk about 'White' which means achromatic which literally means no colour ! Colours like whites , creams have times immemorial represented peace , purity , simplicity. Be it Mahatama Gandhi or Mother Teresa who rose to the epitome of purity chose to drape themselves in white. Taj Mahal a symbol of pure love stands tall in white marble. When all colours come together we get white , the colour of light ! Nature understands this so well but sometimes we need to remind ourselves too. So we bring to you our collection inspired by whites and creams . In our collection we have used self woven cottons & georgettes in creams and whites which have been styled such to retain the aura of the fabric but added a little colour for an air of royalty. A georgette kurta with yellow brocade and light gold lace. 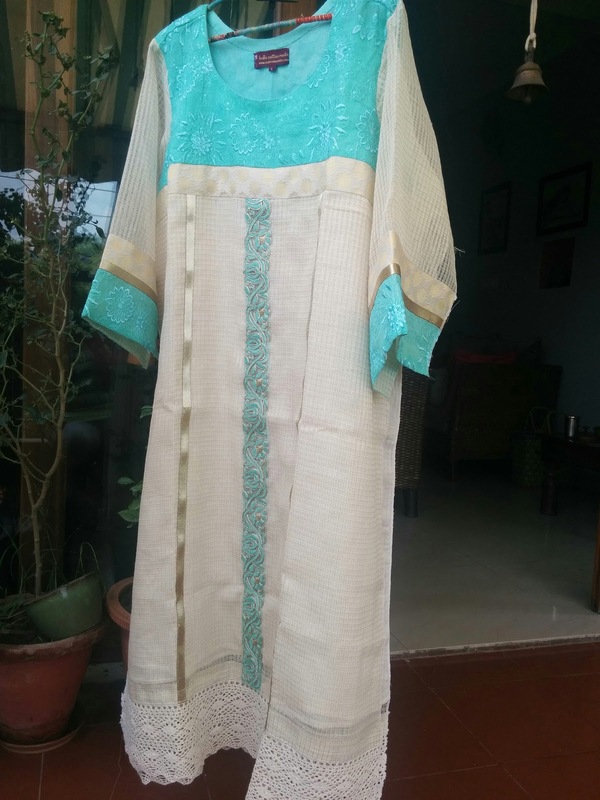 A self cotton kurta with machine chikan yoke , brocade n lace edgings. A self cotton kurta with a pink chikan embroidery yoke , brocade and lace edgings. A self cotton kurta with machine chikan phulkari , brocade and lace edgings. This white/cream collection has been greatly bought and appreciated by friends in India and abroad ! SO LET'S PLEDGE TO BECOME 'THE LIGHT' AND ELEVATE OURSELVES TO THE HIGHER SELVES EACH TIME WE WEAR WHITE !